It was obvious from last summer that our Springtime fixtures would be tough, so it was important to put the also-rans to the sword during the preceding months. 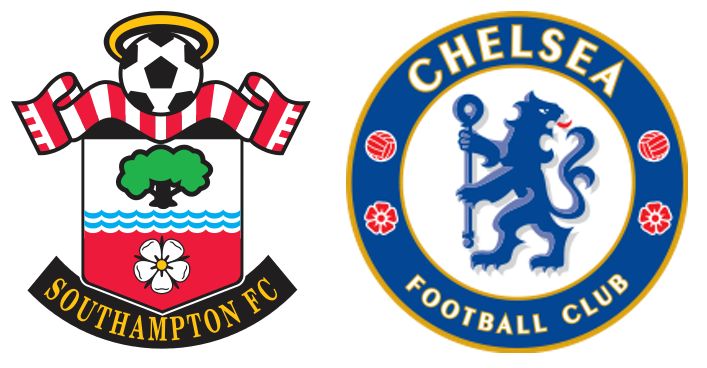 Having failed (unspectacularly) to achieve this Saints were now needing to collect points from the likes of Chelsea (current Champions no less) to retain any hope of avoiding the drop. A battling display at Arsenal the previous weekend had showed a team-spirit lacking for several months thanks, perhaps, to new boss Mark Hughes. However, we failed to come away with any points and, in real terms, playing well and losing counts for the same as playing shite and losing. What Saints needed today was 3 points – and if we played rubbish but won with a deflection off Cahill's arse, I'll take that! Hughes sent out 10 of the same team - the only change being a debut for Bednarek, in for the suspended Stephens. Chelsea made 2 changes with Christensen and Zapacosta replacing Rudiger and Moses. The referee was the eternally useless Mike Dean. We were better served by Sky studio pundits, my mate Denis Wise and Le Tiss. Denis was quick to tell viewers he had more appearances at SMS than Matty. Tiss reckoned, for Saints to do anything, the wing-backs needed to play well. In the commentary box were Bill Leslie and the often-dull Alan Smith. Chelsea kicked off towards the Chapel and enjoyed the early possession. This ended on 3m when Morata controlled the ball with his hand. They continued to keep the ball apart from when Tadić won it, but over-hit his forward pass to Long. Romeu seemed to be tracking Hazard, not letting him settle and getting a foot in when needed. Then, on 6m, Bertie broke down the left, fed by Tadić, and put in an inviting cross but there was no-one on the end. In their next attack, Tadić crossed from a similar position with a similar result. This link between Tadić and Bertie worked well down Saints' left. On 8m, another Tadić cross came in but this was gladly grasped by Courtois. Chelsea's counter saw Morata go over when challenged by Hoedt. They recovered possession but a forward ball towards Willian ran out for a GK. Hoedt hacked the ball out when Chelsea next threatened and as the ball reached Long he was flattened by Cahill; Dean waved play on – no change there then. On 12m Saints got a free kick for Kante's foul on PEH: home fans cheered ecstatically. Losing possession Saints pressed well to deflect Chelsea but the away side eventually got forward. They were awarded a corner despite the ball clearly bouncing off Morata but, thankfully, McCarthy collected the cross. On 16m a Chelsea break involving Hazard and Willian threatened to open the scoring but the Brazilian's cross was too near our keeper. Their next attack saw Romeu foul Alonso allowing Willian another go. His kick was too close to Morata for comfort but McC watched it all the way and held on. Then Saints attacked. This time Tadić went down the right but Courtois grabbed his cross. On 21m Saints went ahead. Another surging run by Bertie saw PEH send him past Azipulcueta. Our #21 cut into the box and cut the ball back to Tadić who turned it in. 1-0 Saints. Two minutes later, Bertie was at it again. This time Tadić played him down the left but his cross was hacked away with Long closing in. Then Long was nearly on the end of JWP's cross but as it went beyond him Courtois was obliged to collect at Cedric's feet. Chelsea gradually pushed Saints back and the officials missed a clear shove on Bertie by Zapacosta. Fortunately, his header back across our goal was stuck over by Morata. Chelsea then won 3 corners in succession – the 3rd was claimed by McC. Morata and Yoshida exchanged fouls before Bertie needed to head an Alonso cross away. A further foul on Yoshida saw Morata get a long talking-to from the Ref. Chelsea's next break saw them lose possession allowing Saints to play the ball up to Long. He turned and ran at the defenders who backtracked, allowing the Irishman to shoot; the ball flew wide. On 37m Chelsea's complicated build-up ended when Cahill's long-range effort flew to the back of the Chapel Stand. Saints next move saw fantastic control by Long, bringing down a pass from the back. The ball came to JWP whose shot was only parried by the keeper; as soon as Tadić moved to the rebound the flag went up for offside. Long kept being fouled but on 41m Christensen clobbered him where JWP might do some damage. His lovely cross was met by Yoshida but his header went wide. As Chelsea played out, PEH first fouled Zapacosta then punted the ball into the crowd earning a booking. The next incident deserved a card of a different colour. As Willian turned away from Long, Alonso stamped on the Irishman's calf. Long went over, clutching his lower leg. The referee was right by it and did nothing. JWP had seen it all. Incensed that Chelsea would not put the ball out, he hunted down then flattened the ball-carrier, earning himself a booking. The referee deflected all protests with his trade-mark imbecile grin. We weren't to know it, but that incident virtually ended Saints Premiership tenure. With 10 men, a misfiring front line and a goal down, Chelsea would have struggled to overcome even the one goal advantage we enjoyed at half time. Both Le Tiss and Denis laid into Dean and agreed Alonso should have gone. That he did not was an affront to fair-play. What makes it even worse is the subsequent charge for violent conduct brought against Alonso. That does nothing whatsoever for Saints – the injured party. Instead he will be banned against Swansea FFS! If the punishment doesn't fit the crime, why bother? Conte clearly put a rocket up his team at half-time. They were, apparently, heading for a 4th successive away defeat. However, Saints continued to dominate the match and might have extended their lead when another peach of a pass from PEH sent the recovered Long bounding away. He took on both markers, turned and hit a super left foot shot that Courtois did well to tip over. Around 55m Chelsea began to pen Saints back and McCarthy was obliged to make smart saves from Hazard and Willian. On 58m Bertie won another corner. But, as Chelsea attempted to smuggle the ball out, Kante was penalised for a foul on PEH. JWP's perfect cross avoided all the big defenders for debut-boy Bednarek to meet at the far post. His crisp half-volley flew past Courtois. 2-0 and all was well. Well? Well no. Chelsea immediately brought on Giroud and Pedro for Morata and Zapacosta. Hazard however, seemed to be losing his rag. First, he argued when penalised for n obvious handball; then he was booked for throwing the ball in Hoedt's face when Saints were awarded a throw. Dean was happy enough to book Bertie for fouling Azpilicueta but moments later, when Fabregas broke up Saints' attack by passing back to his keeper, the official appeared not to see it. He then awarded a free kick for a supposed foul on Hazard. The ball was rolled to He Who Should Not Be On The Pitch who crossed for Giroud to head past McC. Within the next few minutes HWSNBOTP helped Chelsea score 2 more. First, he set up Willian whose left-wing cross found Hazard who scored with a fierce shot. Then he was fouled by Romeu – wouldn't have happened if he'd been sat on the bus outside. From the free-kick the ball dropped to Giroud who scored his second. From 2-0 to 2-3 in no time. Feck it. With 12m left plus 5 more added time, Saints battled to get something from the match – to no avail. It is so frustrating. Hughes was available in January while the transfer window was open and we had enough winnable games left. The bloody club sat on their hands till it was too late.